In 2014, prescription benefit trend climbed to double digits, spurring many payors to adopt more aggressive management strategies. Among these, an aggressive approach to formulary design was a key component, and it proved to be extremely effective. In 2015, trend slowed considerably for CVS Health clients. This year, our first-quarter data indicates that cost growth continues to slow. Formulary has been a mainstay of pharmacy cost management for more than 25 years. It has evolved throughout that time and continues to do so today. For most plans, the simple tiered formulary that was once standard is an inadequate response to current market dynamics. Today, payors face ongoing double-digit brand inflation, ever-increasing spend on specialty, rising launch prices and the slowing of the generic pipeline. Plus, in recent years payors have faced increasing "hyperinflation," when prices for some drugs increase by as much as 5,000 percent in a single year. 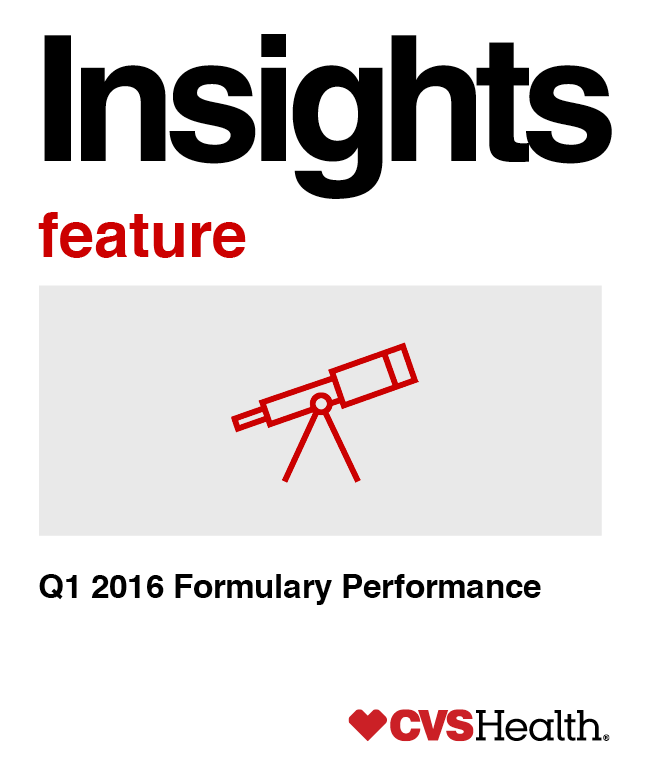 In this issue of Insights Feature, we offer a look at formulary performance in the first quarter of 2016, and the savings plans and their members realized from our managed formulary options. CVS Health is committed to delivering lowest net cost with solutions that anticipate and respond to market forces. We take a holistic approach and look at total cost for the client, not just the price for an individual drug. Our cost management approach begins with intelligent purchasing, which involves a strategic assessment of the market, including the pharmaceutical pipeline, clinical evidence and actions by other purchasers. This strategic assessment, paired with our scale, allows us to move on the right opportunity at the right time and negotiate with pharmaceutical companies from a position of strength, helping us deliver value to our clients. To help protect our clients in a market characterized by excessive drug price increases, we negotiate price protection with manufacturers. If the manufacturer raises prices above a certain point – say 7 percent – the manufacturer will rebate the excess cost and it will be returned to the payor. More than 90 percent of our manufacturer contracts now include price protection. Our formation of Red Oak Sourcing, the largest generic sourcing entity in the United States, has proven to be a critical asset to help drive competitive pricing when plan members utilize a CVS Health channel – our retail, mail service, specialty or long-term care pharmacies. We offer a range of strategies to help manage utilization. Formulary is fundamental among those strategies. We have been ahead of the market in launching formulary innovations, including the removal of drugs from our formulary in 2012 and day-one control of new product launches and line extensions in 2015. Since 2012, these strategies have helped save clients more than $6.4 billion.1 Even our competitors are beginning to acknowledge our leadership position in formulary management and are implementing many of our strategies that they originally criticized. In early 2016, we introduced Dynamic Trend Manager. Informed by our real-time surveillance and monitoring tools, Dynamic Trend Manager allows clients to rapidly apply solutions to help address key trend drivers and blunt the impact of market dynamics. Determining a formulary strategy is a complex balancing act. Cost management is key, but payors must also weigh the impact of these decisions on members. The CVS Health managed formulary offerings allow us to get the lowest net cost for clients and support our commitment to deliver the best care available. Formulary changes are a concern for many clients. Changes inevitably involve some degree of prescription transition – when members need a change in therapy to a therapeutic equivalent on the formulary. We have carefully monitored transitions and found that about 1 percent of affected members drop off therapy. However, our analysis also shows an improvement in adherence of about 2 percent. The net result is more members on therapy. We help to facilitate transitions and maintain member satisfaction with direct engagement and communication with members and physicians. We are also able to project impact on members in a specific population. Typically, for example, drug removals from our Standard Formulary affect fewer than 2 percent of members. Broadest coverage of generics, brands and specialty medications. Savings from rebates and drug removals. Updated annually with new products and strategies to control expenditures. Coverage of select generics and brands. Savings from rebates and drug removals. Includes embedded controls for specialty medications. Updated quarterly. Covers most generics, select brands, including specialty medications, with tier exceptions or higher copays for non-formulary brands. Savings from enhanced generic dispensing rate (GDR). Updated quarterly. In categories with multiple therapeutic options, our managed formulary options focus on lower-cost brands. On average, brands on our Standard Formulary cost about 15 percent less than those on custom formularies. In the first quarter of 2016, clients who chose to align with one of our managed formulary options had costs nearly $20 to $30 lower overall per-member-per-month (PMPM) than those with a custom formulary. Although the rate of new generic entries to the market has slowed, generics continue to help keep costs low. With a focus on generics, Value Formulary is designed to help improve GDR and savings. Value Formulary users saw their GDR climb to 88 percent. A 1 percent increase in GDR typically results in approximately 2.5 percent savings on gross spend. Members benefit as well. With our managed formulary options, members can save from $30 to $60 a month by using generics. We consider many factors when evaluating drugs for ongoing formulary inclusion. Drugs are considered for removal only if lower-cost, therapeutically equivalent brand or generic alternatives are available. Other factors considered include price inflation, market share and manufacturer share retention strategies, such as copay assistance cards. Price inflation accounts for 80 percent of pharmacy trend year-over-year. Double-digit inflation is common for branded drugs in the current market; some products see price increases multiple times a year. With our real-time surveillance tools, we are able to closely monitor these developments and offer formulary updates throughout the year to help protect clients from any resultant surges in spend. Hyperinflation — an increase of more than 100 percent — has occurred with a number of drugs in recent years, drawing considerable media and some governmental attention. On the whole, however, hyperinflating products have had little impact on trend. Rigorous formulary management can reduce exposure to such outliers. Our analysis shows that, over three years, drugs removed from our Standard Formulary between 2012 and 2016 had significantly higher rates of inflation compared to drugs we retained on our formulary. In 2016, a comparison of cost-per-day for select removed drugs and their preferred formulary brand alternatives showed significant savings. When the preferred formulary alternative is a generic, the savings multiply. However, manufacturers of products facing competition may target members with patient assistance in the form of copay coupons, thereby hoping to retain market share. With a coupon, member out-of-pocket costs can drop to zero for the non-preferred product. Then the prescription, now “free” to the member, increases payor costs significantly. With Value Formulary, which covers all generics and select brands, the effect of coupon use can be mitigated. Most brands are not covered; members would have to pay the full cost of the drug in order to fill the prescription. Increasingly our clients see proactive, dynamic formulary management as a necessary response to the current market and our results attest to the validity of this approach. To help support our clients, this year we launched Dynamic Trend Manager, which enables rapid identification and response to evolving market events. Now we are introducing a solution aimed at supporting clients’ long-term goals by gradually transitioning a plan to more rigorous formulary management. Value Formulary, which focuses on maximizing utilization of generics, can effectively increase savings, but we recognize that many payors may be reluctant to require that members across the plan transition to generics all at once. We are offering payors the option to phase in Value Formulary over three years. In each phase a select group of drug classes will transition to Value Formulary guidelines, thereby spreading member impact over time. In the current market environment, plan sponsors' approach to formulary is one of the most important strategic decisions they can make to control their health care expenditures. We believe that formulary management continues to be one of the most effective ways to manage drug trend while ensuring member access to appropriate clinical care. CVS Health is a leader in providing innovative, proactive solutions that help to cost-effectively manage trend while still ensuring member satisfaction. 1. 2012-2016E; 2016E based on midpoint of 2016 guidance. Data Source: CVS Health Enterprise Analytics, 2016. All cohorts used for analysis in this briefing are age-adjusted to commercial means. Custom formulary cohort includes employers. CVS Health template formulary cohorts include employers and health plans. All of the savings and/or trend changes discussed in this Insights Feature will vary based on a variety of factors, including demographics, plan design and programs adopted by the client. Client-specific modeling available upon request.